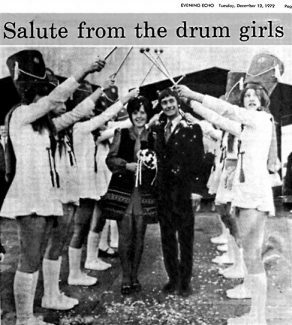 Drum Majorettes of Hadleigh Boys Band form a triumphal arch of batons for a couple who found that music is the food of love. Telephone engineer Peter Lovelock met Jean Brankin, the majorettes’ officer, when he moved from Colchester to Leigh to spend more time with the band as their second officer. Peter, 35, of Leigh Hall Road, and Jean, 27, a telex operator, of Western Road, Leigh, were married at Southend Register Office, after a year’s courtship. Unknown to the couple, the band had prepared a surprise for them. As Peter and Jean came out of the Register Office the boys and girls were outside to greet them. The boys played “Congratulations” and the girls formed an arch. Peter said: “During the ceremony I could hear instruments warming up outside and I began to get a bit suspicious. But it was marvellous and we were both thrilled”. The band’s director of music, Mr John Wilson, said: “This was the first wedding in the band and we wanted to make it one to remember. We kept it secret as well as we could”. Editor’s note: Here is an article written by Peter Lovelock about Hadleigh Boys Band.